I was set to get a haircut in Bangkok, upon seeing the GayCut Salon along Silom Road, but never got around to actually getting my hair cut. 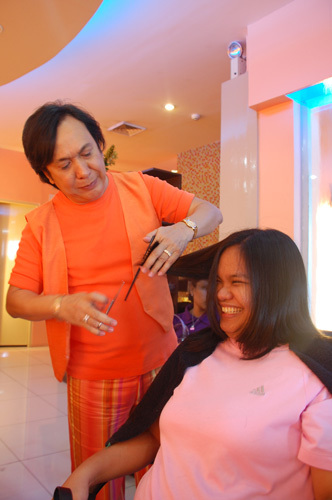 Well, things do happen for a reason, and last Tuesday found me sitting in the hairdresser’s chair with none other than THE Ricky Reyes cutting my hair! 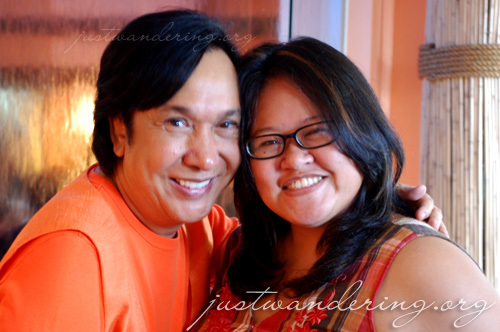 Upon Mother Ricky’s invitation, me and several other bloggers were treated to the salon’s trademark treatments at the Ricky Reyes One-on-One at the Transcom building in Libis. The Ricky Reyes One-on-One is ideal for spa parties, makeovers, and spa-themed bachelorette parties where girl friends may pamper themselves in luxurious beauty and wellness treatments. After a day of pampering and chitchatting with friends, how can you be stressed? Gail, Marc, Eric and I walked out of the salon in good spirits. Ricky Reyes One-on-One is located on the ground floor of Transcom Bldg, beside Fun Ranch and Tiendesitas, Libis, Quezon City. A variety of beauty and spa treatments such as rebond, hair reborn, hair cut, professional massages, facials, hair spa, foot spa, manicure, and pedicure in the comfort of a private venue is offered. For inquiries and reservations, call the Ricky Reyes hotline at 7217705 or 7235440.